The factors influencing hole deviation are extensive, they are generally divided into three kinds, the geological factor, the technical method factor and operation factor. The geological factor mainly includes the rock structures, anisotropy, the schistosity and bedding, soft and hard interbeds and occurrence and so on. The technical method factor mainly includes the deflection in hole opening, the well wall annular space, the rigidity of the bottom drilling tool assembly and deflection state and so on. The operation factor mainly is the feeding WOB. 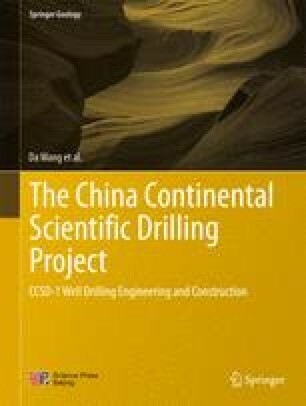 During drilling CCSD-1 Well, the strata factor and features of bottom drilling tool assembly were the important factors. Since the strata factor was unchangeable, so the reasonable bottom drilling tool assembly was mainly taken with help of the WOB control technique to prevent the hole deviation.